It is very unusual for me to get on the subway in the morning and not get a seat. But this morning my disappointment made way for excitement as I discovered a heretofore unknown and incredibly awesome hairstyle. Apart from the man with dreadlocks that stand so high he has to duck in order to get in and out of the subway car, this is the most interesting hairstyle I've seen on the F train. The best way to describe it is this: Imagine you're watching a colorized version of Bride of Frankenstein, where they decided to use a burned out shade of red for the title character's hair color. Next, you realize you're not watching a colorized version of the movie, but a remake from the Soviet Union. The Bride is played by a middle-aged Polish woman. Then, somehow, one of Dr. Frankenstein's experiments goes horribly wrong, resulting in an explosion from above. The Bride's hair takes the brunt of the blast. This is what the hair style looks like. Dude. 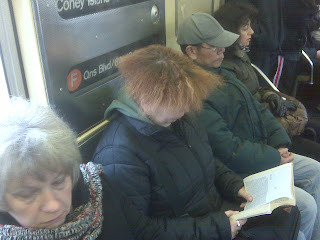 Maybe her hot comb broke that morning? Maybe she got into a fight with her Greek boyfriend and he kicked her out the house before she could get her hair done. Either way starting next year you won't have to worry about her and about 35% of the rest of NY'ers being on the trains. After the MTA raises the fare to $2.50 they won't be able to afford to get on it.